Do you have a train enthusiast on your hands? Do you hear choo choo and chugging sounds a whole lot? 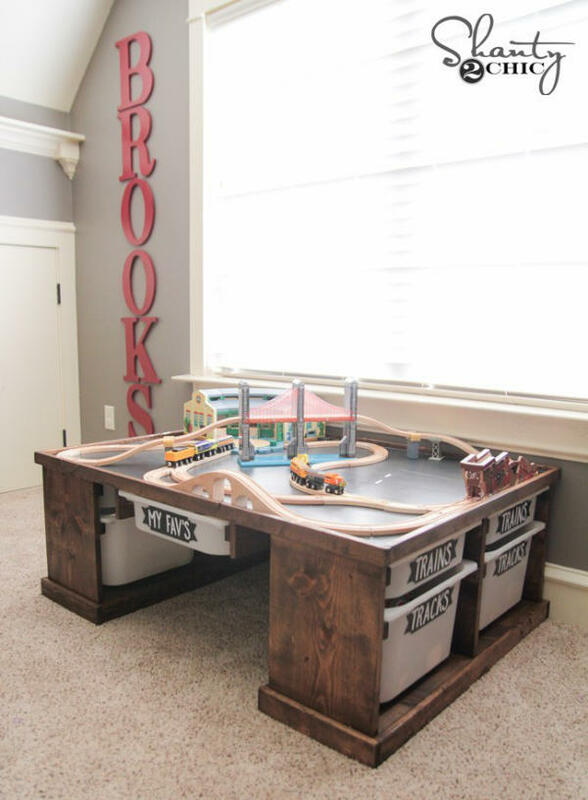 If so you may want to consider a wooden train set and a DIY Train Table! 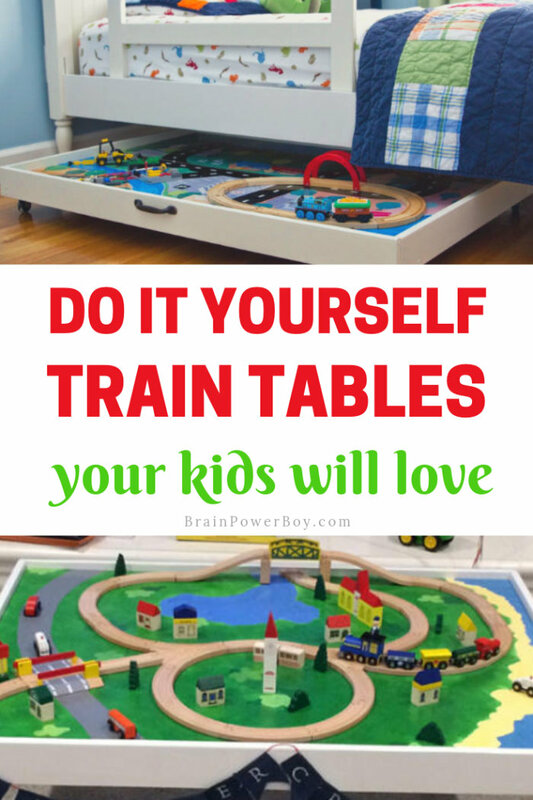 We had a train table when my son was young and it was a hit. We actually bought a table that was made for something else and turned it into a train table. I’ll write up a post soon about it so you can see what we did. 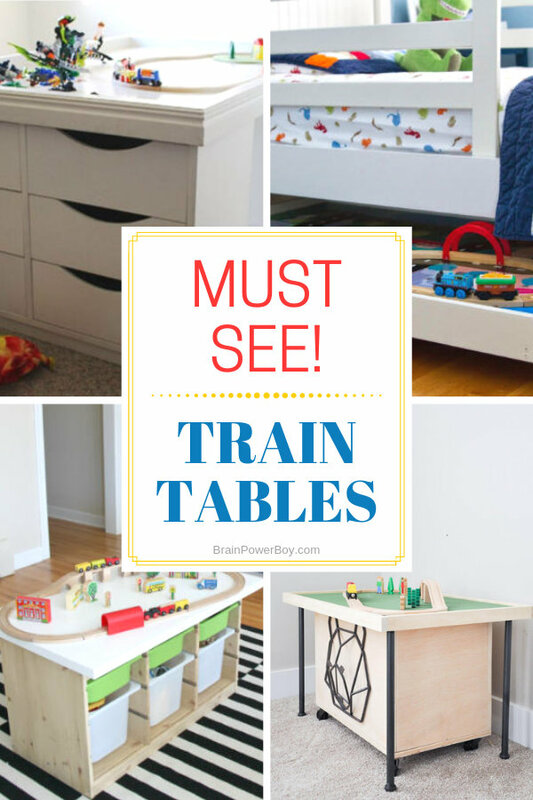 There are a lot of different types of train tables you can make yourself. People have come up with wonderful ideas and they are all a bit different. You can choose from those that are easy to make, those that are big or long, those that include storage or perhaps you need a one that is perfect for a small space. No matter which type you need, you will find all of them right here. Note: I am all about open ended play and think it is one of the most important things our children can do to help them learn. Train tables are awesome. They can, however, be a bit limiting if they are too small. What I liked best about our Thomas the Tank engine train sets and track was how many different setups we could make with the track we had. Sometimes these took up our whole family room! They were very large and very involved. I think it is great for kids to be able to do that. 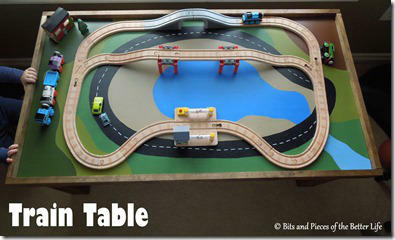 If a train table is too small it makes it tough to create different layouts. Another thing to keep in mind is that if you nail, (or heaven forbid, glue!) the track down to a table, that is going to limit you as well. Some parents really like things to be nailed down because then the track isn’t all over the floor and the whole setup is neater looking. I liked using our table and expanding the play onto the floor. Either way, train sets are a wonderful toy and having them out and ready to play with makes them get used even more. 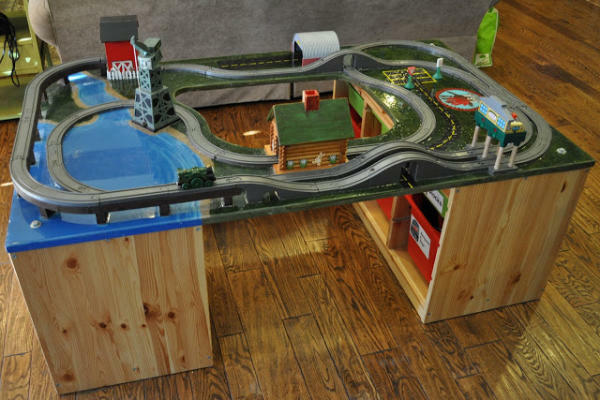 I found a lot of very neat train table ideas. We will start with some IKEA hacks, move on to tables with storage and end with some unique designs. I hope you find exactly what you are looking for. 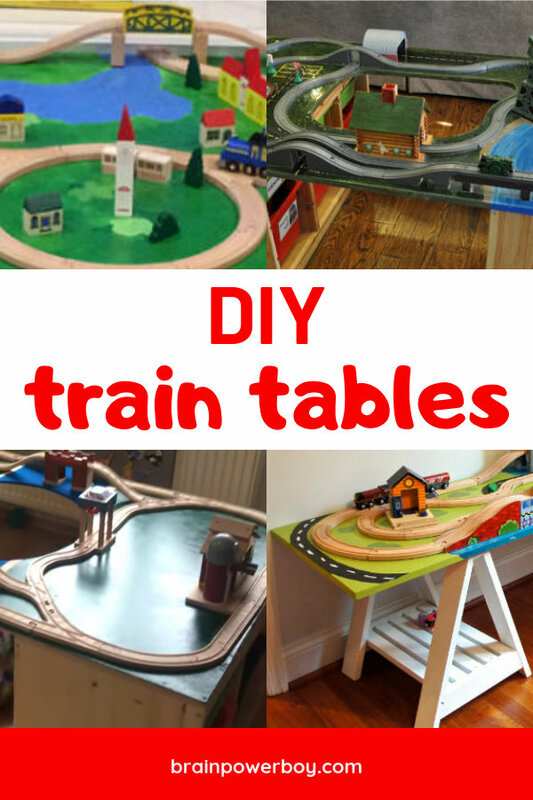 Remember since you are DIY-ing you can easily nab ideas from different ones and pull them together to make something perfect for your train fan. If you are a fan of IKEA, you know you can use their items to hack all sorts of cool DIY ideas! In this case you can hack a train table. 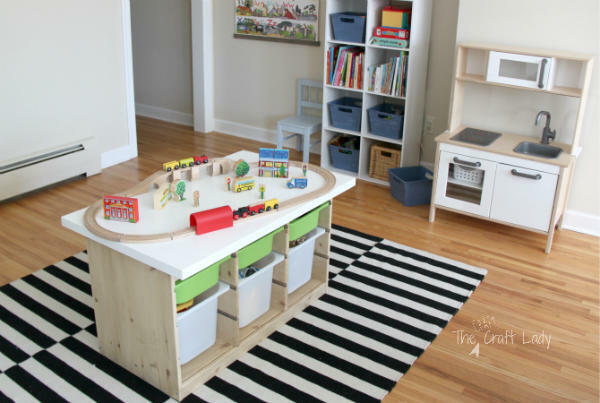 This table uses the TROFAST system to make a nice stand-up train play table. 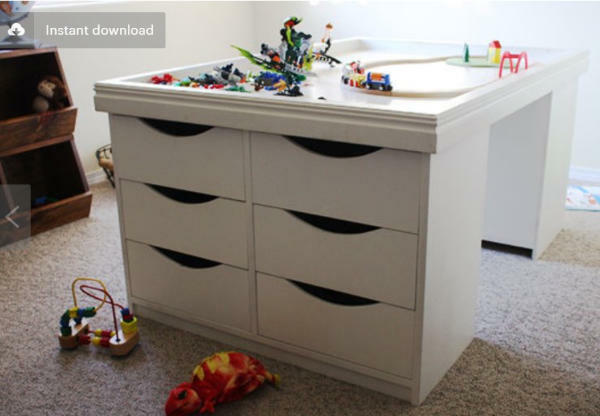 This is also an IKEA TROFAST hack, but in this case they just used the bins, not the furniture item. They built a nice table out of wood designed around the bins so they would simply slide right into the unit. It is amazing what you can make with a sheet of plywood, some wooden boards and few tools and paint, isn’t it?! 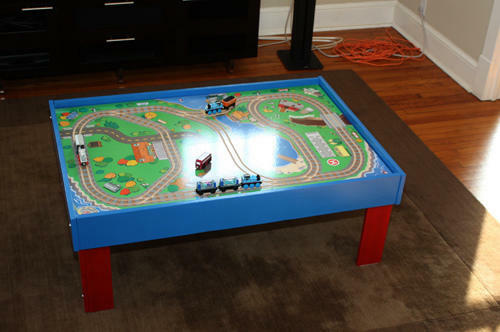 If you didn’t know better, at first glance you would mistake this for an official Thomas train table. It is an awesome DIY and the guy that made it should be very proud of his work. He built a wooden table to house a purchased Thomas top. 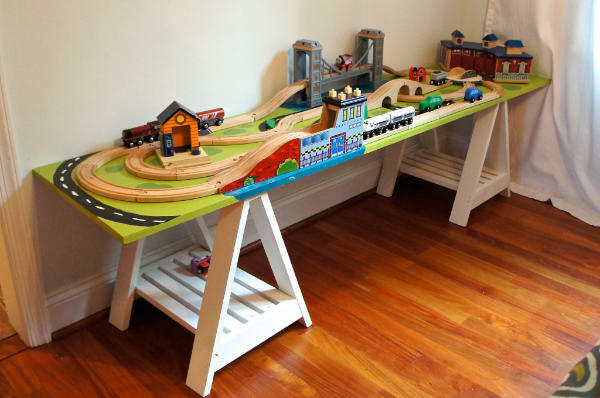 When a person who is into design makes a table for wooden trains, this is what you can end up with. Whoa! Pretty darn slick. Check out that bear on the front. I bet it looks great in their space. The drawers are a win because they keep everything looking very nice and tidy. I also like that this table has a small footprint so it is great for those who want to add it to a small bedroom, play area or living room space. It is a completely different and modern take on things and I’m sure some people will prefer this to the more colorful versions. Watch the video right here. She shows you how she makes it. If you do not have a lot of space, this idea is a great one. 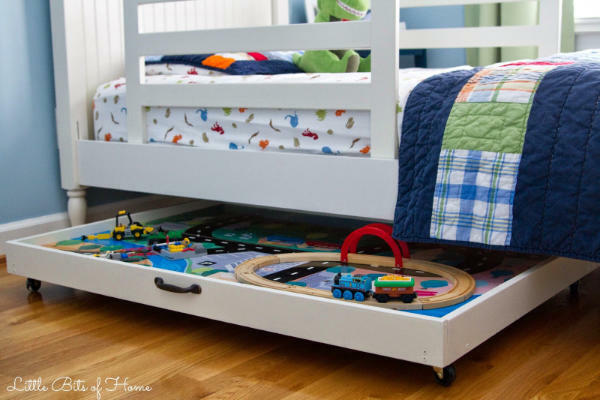 Make an under the bed train table for the bedroom. It slips right under the bed which makes it easy to put away. In this case, she actually took apart an old train table that wasn’t really working for them and made this out of it. You could also do that but with some plywood and wood and make one of your own in this same style. If you need a table but want something that they can stand up at and that you can stick against a wall, try this. It is 6 feet long! This table has an unusual feature that is just right. Kids can crawl under the table and pop up in the hole in the middle. Here is another version with the pop through hole in the middle of the table for ease of use (and fun!) He walks through quite a few details of the table and runs over the completed track layout as well. This one is both an IKEA hack and a unique design. I am tossing this in here in case you want to make one of these and want actual plans for a train table instead of winging it or trying to follow along with the ones above.